Yes, how do I find this bench?! Level up. Add interest to the room by hanging plants or art at different levels. This draws the eye up, down and across the room and allows for visual interest without clutter. It helps create the “informal, asymmetrical, come-stay-awhile kind of look” that boho beach-style is trying to achieve, Sartor says. Muted pink and purple tones in an all-white room work well, as they’re gentle and add a sense of calm. Modern bohemian. With its use of bold color and patterns, bohemian style would seem to be the antithesis of minimalism. 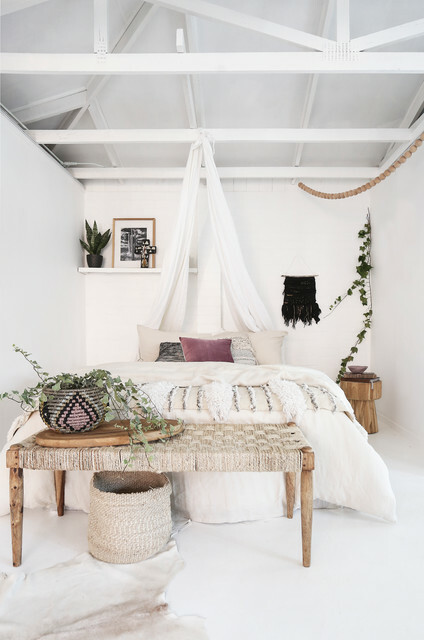 But this bedroom is a great example of how to get a bohemian feel without intense color and pattern. Instead, the designer uses various cream-colored materials and textures on the bedding, walls and accessories to create interest. The light woven bench and natural-colored baskets throughout the room add texture without making the room feel cluttered. I love the plants. I love the variety of heights. Eyes move up and down. Good use of the tall ceilings.